The whole body CT has become a commonplace strategy for trauma in the UK. When a trauma patient is in your emergency room, it’s a quick and accurate detection method for most injuries. The primary survey in the resus room is all well and good for the initially life threatening injury, but the CT detects so much more, and following a number of papers looking at injury detection and survival UK trauma centres are targetted to get patients to the CT scanner within 30 minutes of arrival in the ED (http://www.stemlynsblog.org/ttl-podcast-1-getting-ct-30-minutes/) This is a hard target to hit with the sick trauma patient, and cna become a bit mechanistic. It’s quite easy to request a whole body scan, but should that be our default position? Could we reduce radiation dose with selective imaging? Will total body CT reduce mortality or is it unnecessary exposure to radiation? Does a total body CT break the first rule of medicine: First do no harm. REACT 2 aims to answer these questions, an RCT of WBCT vs selective imaging. The abstract is below, but as ever we always recommend you read the full paper (sadly it’s not open access). From April 2011 to January 2014 five ( 4 in Switzerland and 1 in the Netherlands) level 1 trauma centres took part in this randomised control trail. Following the arrival of a trauma patient and the ambulance handover, a primary survey was completed. Lifesaving interventions were performed; these included securing the airway, insertion of chest drains, pericardiocentesis, haemorrhage control, pelvic binder application and peripheral cannula insertion. Patients in the control group would receive and chest and pelvic X Ray, followed by a FAST scan, followed by a selective CT scan. The CT scans done were dictated by local hospital protocol. The primary endpoint of the study was in-hospital mortality. Mechanism of injury: Fall from height >3m, Ejection from the vehicle, Death of occupant in the same vehicle, Severely injured patient in the same vehicle, Wedges or trapped chest/abdomen. These are pretty broad categories and would include quite a large number of potential patients. Mechanism of injury is always an interesting one as it can be a very sensitive, but not terribly specific tool. Thus might mean that the patients in a study like this may be different to the ones we see in the resus room at Virchester. They excluded the usual suspects, children, pregnant, too unstable to go to CT and those who clearly had an isloated injury. 3860 patients were excluded prior to randomisation. Following randomisation a further 320 patients were excluded. Are the control and intervention groups similar? The study had a total of 1,083 patients included in primary analysis, split into 541 in the intervention arm and 542 in the control arm. The groups were very evenly matched; there were only 2 statistically significant differences. Median Injury Severity score was not statistically different between the two groups – 20 in total body CT vs 19 in standard work up. However 67% (362) of the total body CT patients had an ISS of ≥16 compared to 61% (331) of the control group (p = 0.045) so they look to be more severely injured. The main outcome was in-hospital mortality, and they found no statistical difference p= 0.92 (86 patients (intervention) vs 85 patients (control). Secondary outcomes showed some small differences, with time to identification of life threatening injury being shorter for the CT group 50 mins (intervention) vs 58 mins (control) p=0.001, time to imaging was shorter for CT and unsurprisingly the radiation exposure in the intervention group was different. However, the difference in radiation exposure between the two groups was really small, just 0.3mSV and that’s really interesting. We might argue that this is a real reason to be wary of WBCT, but if the difference is not that great should we be so worried? It’s a tricky one to work out for sure, but if you go over to XRayrisk.com you can do a rough calculation on the effect of that difference. Plug in some numbers and for a 20 year old male (not an untypical trauma patient) the difference of 0.3mSV equates to a lifetime increased risk of cancer of 1 in 28855! So, the primary outcome suggests no real, but there is a slight delay in the time to identify and image injuries. However, the difference is only a matter of minutes and is arguably not that clinically important. This is a large multinational randomised control trial. Power calculations done showed that to demonstrate a reduction in mortality of 5%, 539 patients would be needed for each group; this would demonstrate a risk reduction with the power of 80%. The study successfully recruited slightly over this number of patients in each group. There were strict inclusion criteria that were realistic for the everyday assessment of a trauma patient, and reflect the information a trauma team leader would have prior to imaging patients. This paper does reflect a real world problem and the design is a good one. My only thought is that the statistical approach was to try and demonstrate a difference. This requires fewer patients than a non-inferiority trial and in my head I think that more closely reflects my question. If WBCT is standard practice (it is here) then I my question is one of equivalence not difference. This study has its limitations. There was no blinding to the randomisation process. A large number of patients have been excluded following randomisation; this includes 60 patients for which the reason given is does not meet inclusion criteria. Does this mean the TTL didn’t like the group to which the patient was assigned, as prior to randomisation they had decided the patient was eligible? Did non- blinding to the randomisation effect who was eligible to for the trial. Eligibility was decided by the trauma team leader following primary survey. This leaves the trial open to potential bias at enrolment stage. From patients in the control group 46% ended up having a total body CT scan, due to a combination of segmental scans. It would be interesting to see this 46% for subgroup analysis, can we predict who this is going to be? If these patients were put into the total body CT group would this affect the studies primary outcome? The intervention group had a larger number of patients in with an ISS greater than 16. If the control group (standard imaging) had a similar number of patients with severe injuries, would more injuries be missed? 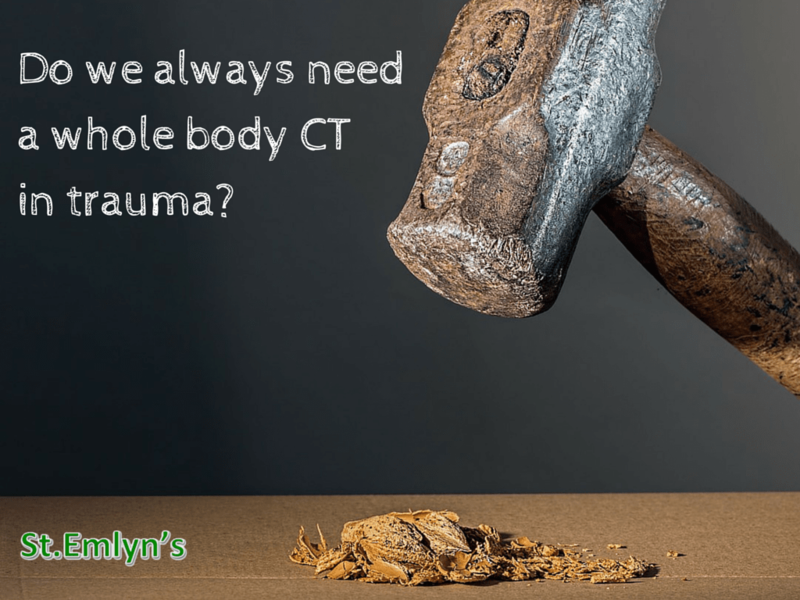 Would more pateints have eneded up with total body CT scans? Would this have changed the mortality outcomes? There is no difference in hospital mortality or missed injuries. If there is no difference in these out comes, then how important is it that we find these injuries quicker with a total body CT scan? As @EMManchester often says, emergency physicians are the experts in undifferentiated resuscitation, if are patients deteriorate before we know the exact injuries, we are the specialty that can support them through this. Total body CT didn’t reduce time spent in the emergency department, so for the target lovers out there, this would not help. However total body CT scan is the quickest way of getting imaging done and getting answers. How much radiation in real terms are we actually exposing these patients to? 20mSV is the maximum dose of radiation that a person working in the nuclear industry in the UK is allowed to be exposed to over a year1. Median radiation exposure in both groups exceeds this. However it is worth noting that in the control group the range was 9.9 mSV – 22.4 mSV compared to the total body CT group the range was 20.0-20.9 mSV. In the UK the government website quotes an annual average radiation dose of 1.2 mSv- 7.8 mSV depending on where you live 1.So some patients in the selective CT group are getting just over a year’s dose of radiation in one go. Risk from radiation exposure does vary with age so these numbers can not be directly be translated into risk of complications. However if given the choice I would rather not spend a year in a nuclear power plant unless it is going to significantly improve my care! There is no difference in mortality outcome for trauma patients who have a total body CT compared to selective imaging. Total body CT scan does increase the patients exposure to radiation, but by an amount that is surprisingly small (on average). This may be because a large percentage of patients who have selective scans ended up with the equivalent of a total body CT. Total body CT does give the quickest answer but does not ultimately reduce time spent in the emergency department. In other words it seems that both strategies work. The paper that made me change to WBCT: Effect of whole-body CT during trauma resuscitation on survival: a retrospective, multicentre study. Huber-Wagner S1, Lefering R, Qvick LM, Körner M, Kay MV, Pfeifer KJ, Reiser M, Mutschler W, Kanz KG; Working Group on Polytrauma of the German Trauma Society. Lancet. 2009 Apr 25;373(9673):1455-61. doi: 10.1016/S0140-6736(09)60232-4. Epub 2009 Mar 25. Previous: Previous post: Thrombolysis in PE – Building a talk for SMACC. Having observed over my carreer the progression from CT as an impressive imaging modality that was used judiciously to the almost routine application of the pan scan in trauma, I feel like a dinosaur when I decide to omit segments of the study based on clinical grounds. I suspected that it never made a big difference to outcomes that a good assessment or close observation couldn’t have achieved. This study seems to support this. But this horse has bolted and pity the clinician when his peers accuse him for failing the standard of care in a multi-trauma when an injury is ‘missed’. There is also a training issue. In a situation where demand transiently exceeds capacity e.g. major disaster, I wonder if the modern clinician will know how to correctly triage which patients actually need an urgent study.